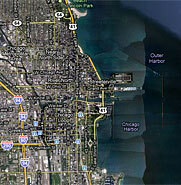 The Loop in Chicago is the most highly recognizable neighborhood in the city. After all, this downtown area is home to the Willis Tower, which is a recognizable symbol of the city. Formerly the Sears Tower, this great skyscraper can be seen rising above the mighty Chicago skyline for miles around, and if you have a chance to head up to the Willis Tower Skydeck on a clear day, you'll enjoy 50-mile views out over the surrounding terrain. Heading up to the observation deck on the 103rd floor is far from the only thing worth doing on a trip to the downtown Chicago Loop, and chances are good that you'll want to spend plenty of time enjoying all of the other great things that this bustling neighborhood has to offer. When it comes to defining the Loop in Chicago, you can generally include the whole downtown area. Originally, the Chicago Loop moniker referred to a more concise area that was served by a streetcar in the 1880s. After that, the name came to refer to the area that was surrounded by the elevated downtown tracks of the CTA train system, or the L, as it is more commonly known; thus the area known as the Loop in Chicago has expanded over time. While the official boundaries of the downtown Chicago Loop include the Chicago River to the west and north, Lake Michigan to the east, and Roosevelt Road to the south, the more general boundaries are somewhat skewed. Most people will simply tell you that the entire downtown area can be defined as the Loop, which is really all you need to know. The Loop in Chicago is the heart of the city, and come weekdays, it's quite a lively place to be. On the weekends, the pace slows down, as the weekday workers are nowhere to be found. Some travelers might say weekday visits to the downtown Chicago Loop are ideal, thanks to the authentic commotion the commuters create. Others will prefer weekend visits, as the relative calm allows for a more unfettered look at things. Loop Chicago visits are interesting regardless of the time of week, as there's always plenty to see and do in this attraction-packed area. To get a handle on the Loop and all that it has to offer, you might look to book a tour. These downtown tours highlight some of the major sights, including the famous Pablo Picasso sculpture in Daley Plaza. There is a wide variety of Loop Chicago tours, and among the most popular are the boat tours, which offer insight into the major sights along the Chicago River. The downtown Chicago Loop, which includes Grant Park on its eastern edge, is home to an impressive public art collection, so Picasso's Untitled sculpture isn't the only piece of art you can check out during your Loop tour. If you are without a guide on your visit to the Loop in Chicago, you might stop by the cultural center on Washington Street and pick up a complimentary public art guide. One sculpture you are bound to easily notice during your Loop Chicago tour is the Cloud Gate, which looks like a giant, silver bean. The work of British artist Anish Kapoor, this sculpture graces Millennium Park, which is a newer city park and a section of the larger Grant Park. The fact that it begins where the downtown skyscrapers end is part of its charm, and you'll definitely want to explore some of it during your visit to the Loop. Grant Park is where you will find Buckingham Fountain, which is a large Baroque-style fountain that figures among the top Chicago attractions. Before you enter Grant Park during your Loop Chicago visit, however, you might stop by the Art Institute, which is city's reigning art museum. You can also head down to the southern edge of the park at some point to explore Museum Campus, where the Shedd Aquarium, the Field Museum, and the Adler Planetarium are found. Heading back into the more strict boundaries of the downtown Chicago Loop, doing a little shopping is something that might pique your interest. While the shopping mecca that is the Magnificent Mile isn't technically located within the Loop, Loop visitors will find it easy to access. Shops abound within the boundaries of the Loop in Chicago as well, so you might want to explore the options if you have shopping on your mind. Finding something good to eat is easy, and there are great downtown bars if you want to stop for drinks. On weekday evenings, many of the bars in the Loop offer free food during their happy hours, so you can keep that in mind when deciding how to spend your time. Once the sun sets, taking in a show is also something worth considering. There is a number of great theaters in the Loop, including the Chicago Theatre, the Cadillac Palace Theatre, and the Ford Center for the Performing Arts, formerly the Oriental Theater. There's too much to list when it comes to things to do and see in the downtown Chicago Loop, and while guided tours are recommended, simply wandering the streets is also a good way to go. You'll find plenty of diversions as you wander. The Loop is home to some of the best Chicago hotels, such as the delightful Palmer House, and these hotels make for great places to stay when visiting the city if you want to be right in the middle of things.